I’m so excited to be releasing my very first doll clothes pattern for 2015, the Pinafore, Dress and Skirt pattern for 18 inch and American Girl dolls! The pinafore dress is one of the more popular items sold at Rosie’s Dolls Clothes and I think one of my cutest patterns too. I’ve been wanting to do this pattern for some time now and I’m thrilled it’s finally here! The best part about this pattern is that you can make three totally different outfits. Firstly, you can make the sweet Pinafore Dress with sleeves mentioned above, and whether you make it with lace on the sleeves and hem or without it’s just as adorable. Then you can make the pattern without sleeves and it becomes a pinafore or apron just like Dorothy wore in ‘The Wizard of Oz’. Then if you just want a skirt, you can do that too. It is a super easy pattern to make and of course comes with LIFETIME access to my step-by-step video instructions which make it even more fun to sew. 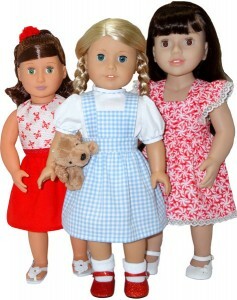 The pattern will also fit the 17 inch (43cm) Baby Born doll ® and the 20 inch (50cm) Australian Girl doll ®. And for my Cabbage Patch ® customers, this pattern will be available soon so stay tuned. Hi Rosie, Thanks, will be buying it. cute…..
Next on my list— I think I could sew anything if you were the teacher! I tell my husband all the time– She is a great teacher!